by Edward S. Baiz Jr.
Hello all. My name is Edward S. Baiz Jr. or Gamer as I am known on the Internet. I am the proud owner of a Hades060 which I love dearly and use daily for Midi, Internet access, DTP, spreadsheet and more. I also own a 1040 STe and a number of other ST's which I use from time to time. I also own an elaborate 8-bit system which includes a 130XE, two 800XL's and a 400. I have tons of 8-bit software which is mostly games, hence my handle. If I had to pick a time in my computer-using career that I enjoyed the best, it would have to be my 8-bit days. I have never had so much fun and was sorry to see it come to, what I thought was, an end. In those days it was the software and not the computer that was constantly being upgrades. 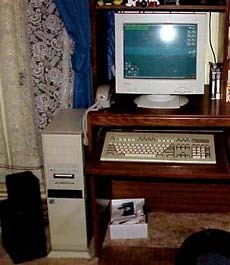 You did not have to worry about having to buy a newer computer just to be able to run the software that was available. The days of the single-author computer games are over, for the most part. When I got my first 520ST, I put away my 8-bit system and simply forgot about it. At first when I ran across an 8-bit user I could make a good conversation about the good old days and talk about basically anything that concerned the 400, 800, 800XL and 130XE. Soon, however, I found myself forgetting about how to do this and that. Everyone began to realize that I was a ST user and not an 8-bit user. The way things have turned out for me, I am so glad I kept my whole 8-bit collection. What happened to me came in two steps. First, I suddenly became interested in the 8-bit when my kids became old enough to enjoy it. Just the fact that they would play on the system made me realize just what I have been missing all these years. A game does not have to have the best graphics and sound to be considered excellent. A true gamer will look for the most important thing in a game and that is game play or playability. Without that a game is nothing. For example, if I had a bowling game and it allowed to roll a 300 every game, how fun would that be? There is no challenge, no skill and hence no playability. My kids love these 8-bit games just as much as the ones they play on their N64 and my Atari Jaguar. I still think kids should do video game reviews and not adults. Okay, now the easy step is over. The hard step began. If there was one thing I hated more in using my 8-bit system was setting it up. All those wires for the drives, the computer and then I had to have a TV. I started to solve this problem when I noticed someone had said that they had hooked up their 800XL to a VGA monitor. Now that is something I wanted to do since I had two monitors in the computer room. The monitor would give me a MUCH better picture than a regular TV. I found out that what was needed was a video converter and a Commodore monitor cable which connected to the C64. The cable has four wires with RCA Jacks that are colored white, yellow, red and black. The white wire works for me and plugs into the "Video In" on the converter. The SVGA monitor plugs into the "Video Out" on the converter. For sound I use the black wire on the cable that plugs into a powered speaker. The setup works just great and I recommend it to every 8-bit user. The cable and the converter cost about $100 ($20 for the cable and $80 for the converter). That may seem high, but I believe it is well worth it. I found the cable at B&C Computers which can be found on the Internet at: http://www.myatari.com/. I found the video converter at Matco which can be found on the Internet at: http://www.mat-co.com/. When you go to the Matco site, look for the converter under the name VGA-801. black wire going to the right is connected to a powered speaker for sound. I still had the problem about the 8-bit disk drive and all the 8-bit disks I had collected over the years. Let's face it, sooner or later those old disks become corrupted and will not work. That had happened to a few of mine (ie. Midnight Magic Pinball), but for the most part, they are still in good shape. My old 810 still functions and I have a PerCom Data and one 1050 drive that still work. However, I have 2 1050's that do not work. I have always wanted to be able to run my 8-bit programs from a hard drive and have them backed up, but I did not want to use a PC and APE as I am an Atarian. I do admit I might have gone that route if I had not come across a great TOS program called 800XLDJ. To be honest, I had run across 800XLDJ a few years ago, but passed on it mainly because I really did not know what it was and the fact that it bombed everytime I tried to run it under Geneva. It ran fine under regular TOS, but the program functions better in a multi-tasking situation. Later on I got Magic for the Hades. I downloaded 800XLDJ when someone else recommended it me. I gave it another try under Magic and was pleased that it ran. Basically, 800XLDJ is to TOS users what APE is to PC users. It simulates an Atari disk drive and uses disk images (DI extension) to load programs. It also needs the SIO2ST cable which the same thing as the SIO2PC cable. I use the SIO2ST name as it sounds better to an Atari user. You can build the cable yourself or else buy it. I bought mine from a guy in Germany who is super and fair to all his customers. I believe I paid about $20. The site to go to is: http://home.t-online.de/home/tgrasel/restarte.htm. You can also buy the Xformer cable for the PC and other 8-bit items. To set yourself up just plug one end of the SIO2ST cable in the 8-bit (800XL or 130XE) and the other end into the RS232 port on the ST. For the Hades I used the Modem 1 port. I did not try the program on my Atari 400, so I am not sure it would work. I see no reason why it shouldn't though. After loading the program, you can see when looking at the title screen, that the program was written and compiled in 1994. That always seems funny to me as I had really have heard nothing about it until the last few years. If I had, I would have used it. The opening screening is a bit mystifying. You see a row with little disk drives numbered 1 to 8. This of course means that the program can handle upto 8 drives at one time which is the same number of actual drives an 8-bit machine can handle. You will also notice when you click on one of the drive icons, the front of the icon goes from black to white. This simulates the drive being closed with a disk inside (black) or drive being open with no disk inside (white). At least that is what I think since nothing loads when the icon front is white. Just below the row of icons you see "New Disk" and to the right is a drive with a 1 inside it. This means that "New Disk" is drive number 1. You can make it drive number 2-8 just by dragging one of the appropriate icons down and onto the right side next to the disk. By highlighting the disk and clicking on the "Disk" option (above the row of disk icons) you get a number of options which includes format. Here you can format the disk image in a variety of densities. After formatting you can then use the disk image just like any disk. If you double-click on the disk image after formatting it, you get a GEM box that contains all the disk's contents. Of course after formatting, the screen should be blank. To put a file into the image just drag a file from the ST desktop onto the screen and it will imported in. You can also click on the GEM box and you will get a list of options which includes "import". Clicking on "import" brings up the file selector where you can file(s) to import. Of course it is possible to export files also and it works the same way. Very simple huh? I must mention that if you format a disk that 800XLDJ considers not exactly a DOS disk, it will not bring up the GEM box list screen. You will get a notice to that. Do not worry though. Your disk image can still be viewed and used, but only on the 8-bit computer. appearance of how the GEM box for all disk images look. Another option under the "Disk" heading is "Load". Here you can pick any DI images you want to be used with 800XLDJ. After loading them in, you must pick which disk drive number they will be. Another thing you may want to do is to make sure the image has the correct name or label. The label is what appears in the main 800XLDJ screen. If a disk image does not have an appropriate name, what appears on the main screen is the path of that particular disk image. To write a label just highlight the disk image in question and then go under "Disk" and choose "Label". Here you can type in the label of the disk. There is even a place for additional information which does not appear on the main screen. Do not forget to save the disk. This option is again under "Disk". Saving is important. When running a program on the 8-bit where you save disk information, this changes the disk in question in 800XLDJ. However 800XLDJ does not save the disk. You must do that yourself. If you quit the program without saving a disk image, 800XLDJ does remind you that the disk image has been changed and gives you the option to save it. I have saved many times because of this. When you create a label for a disk image and save it, it is given the same name as the disk image with the extension "DIL"
There is also another way to create DI image disks. I wanted to have a DI image disk of MyDOS. 800XLDJ comes with DOS 2.5, but MyDOS is much better. The problem is that I could not find a MyDOS DI image disk anywhere. I did have an ATR image disk of MyDOS. I extracted the raw files from the ATR image and copied them to a pre-formatted DI image disk. That did not work. The 130XE gave me the familiar "boot error" message. So I had to do something else. The President of our Atari computer club (IMAGE), Steve Elek, had MyDOS on an 8-bit disk. I had him bring that to the meeting which happened to be at my house. I hooked up the XE to a 1050 disk drive, put in the MyDOS disk and booted it up. Then I unhooked the 1050 and then hooked up the SIO2ST cable. I loaded in 800XLDJ and highlighted the "New Disk" image and made sure it was disk drive 1. I then went to the XE and had MyDos format disk drive 1 in a double density. I then went back to my Hades and double-clicked on the "New Disk" image icon which brought up a blank GEM box. Going to the XE again, I had MyDOS write the DOS files to drive 1. While it was reading and writing, I told everyone to watch the blank GEM box on the Hades. Almost immediately after the XE was done, the DOS system files appeared. I then saved the disk under a different name and label. Now I had a MyDOS DI image and realized I could do the same thing to get other programs on DI images, preferably some of the commercial game disks that I love so dearly. 800XLDJ. This list is in a GEM box and can be resized & moved around just like any other box on the ST screen. For what I have said so far about 800XLDJ, you can see just how simple it is to use. When a program asks you to insert a certain disk into drive one, you just have to move the "drive 1" icon next to the appropriate disk image. There are more options to this program than I have mentioned (ie setting colors, setting what certain icons will do, etc). The way I found out how to do things was just to dive right in. For some more information on this program goto the Internet site: http://wwwstud.ira.uka.de/~s_tomczy/dj800.html. Here can read about the program and even download the latest version. So, what I have done with 800XLDJ? I came across some Mega ATR image files that had alot of Atari 8-bit games. There were 22 of them in all and each had about 40-60 games on them. I though it would be great to have these Mega images converted over to DI format. I downloaded all 22 ATR images and set out to do the conversion. What I found I needed was a program that would extract the raw files from the images to disk. I found one that worked fine for me, but it required a PC. I tried to use it under SoftPC on my Hades, but that did not work. This program I used ran under MS-DOS and worked best when I had it extract the files to a 3.5" disk rather than the hard drive. Oh, I used my wife's PC for the extraction. A surprise to her and me since she knows how Pro-Atari I am. Okay, I had the file now what? I needed to create a disk that could hold about 1 meg of data since most for the Mega ATR images were of that size. Then I remembered that MyDOS could format disks that could hold upto 16 meg of data. I then created a blank high density disk, which turned out to be only 17k with nothing on it, by using option "O". Again, since the format of the disk is not normal, I could not bring up the disk's content using 800XLDJ. I could only view it when using the XE. Now that the disk was done, the rest was simple. I formatted another disk which was about 250K. This was the largest disk I could create that would allow me to view it's contents using 800XLDJ and also allow me to copy the contents to the mega DI image in question. Now I was set. I open my formatted disk to get the blank GEM box screen. I opened up the list of raw files to be imported. I made sure MyDOS was booted up and loaded on my XE. I then highlighted the files I wanted to import and made sure the size was less than 250k. I then dragged then to the blank GEM box of my formatted disk image, clicked ok and watched as the blank GEM box was filled with the raw files I had selected. The blank disk was usually drive 1 and the mega DI images was drive 2. I would tell use the copy command under MyDos and tell it to copy all the files from drive 1 to drive 2. After the copying was over I made sure all the files were copied correctly to drive 2 by using the disk directory option. If all was well, I deleted all the files from my 250k disk to get it ready for more files and saved my mega DI image. It took me about 2 weeks before all 22 mega DI images were done. Soon these images will be available for download at the following site: http://homepages.paradise.net.nz/atari/. There will also be a zipped file that will contain some useful DI disks (ie MyDos, demos, file select/load programs). All the files on these mega images can be loaded by using the "binary load" command under MyDos. I must mention that there is a gent who has made a program that convert disk images from one format to another. Recently he added the DI format to the list of options. I have tried it out and have gotten some success with the various ATR and XLD disk image files. The more simpler disks are converted to DI just fine, but the more complex disks have problems. I tried to convert an ATR image of "AliBaba and The Forty Thieves" to DI. The conversion went all right, but when I tried to load it under 800XLDJ, I only got the beginning screen and then nothing. Still, I am happy an author wants to include the DI format. I reported my problem to him and hopefully he will have an updated soon. The program can be downloaded at the site: http://www.asw.cz/~kubecj/. Just go into the section of programs that he develops. The only other important thing is that this program only works on a PC. I mentioned to him to put out a TOS version. Hopefully he will comply. and the 800XLDJ program running on a Hades060. A BIG Thanks to Edward S. Baiz Jr. for contributing this very usefull article!